Are you looking for the best hybrid bikes under 500 but not sure where to begin? You have come to the right place as I have picked out the top hybrid bikes available today. For you non outdoor riders you can check out our best spin bike reviews if this type of biking is not your preference of training. Both hybrid bikes and spin bikes can be used interchangeably, but elliptical bikes can do both of how you train indoor and outdoor so please read! Hybrid bikes have become more popular, but quality varies from the excellent to the barely adequate. Fitness trackers have also been used when riders are taking their hybrid bikes outdoor. That’s why I sorted them out and handpicked the best hybrid for less than 500 bucks. If you want to buy the bike right now, just jump ahead to the reviews. If you want to know more about buying hybrid bikes in general, check out the buying guide I have prepared here. Reading hybrid bike reviews helps, but you have to consider other factors which will affect your riding comfort. Hybrid and city bikes often have the road bike 700 C tires. These tires are light, roll smoothly on the pavement and suitable for climbing. Quality hybrid bike tires accelerate quickly. They also have different treads and widths to suit various surfaces. Bikes have different materials but the most commonly used are aluminum, carbon/aluminum, and carbon fiber. Aluminum frame: they’re strong, light, and resistant to corrosion and rust. But aluminum is not as light as carbon based frames. Carbon/aluminum and carbon fiber: these are corrosion resistant, made of light material and more durable than aluminum. However, they’re more expensive than other frame materials. Many hybrid and comfort bikes have a suspension fork, and you’ll want one that protects you from the effects of obstacles, ruts, cracks, and bumps. Look for well-made suspension forks for a comfortable, smooth ride. It’s the suspension that gives you full control of the bike even on rugged surfaces. There are also hybrid and city bikes that offer greater versatility, plus they are more durable on the road. Hybrids also have suspension seat posts that smooth rugged terrain. A suspension seat post is also ideal if you travel pothole covered roads. Look for low gear derailleur drivetrains if you need help bike climbing. If you mostly bike on highways and flat surfaces, you’ll do fine with few or even a single speed gear. If you often bike uphill or rolling terrain, you’re going to need a few more gears. The good news is most hybrids have button style levers so you can shift gears easily. Most hybrids also show which gear you’re in. The best sub 500 hybrid bike has linear-pull brakes which give you superior stopping power. Some bikes also have a hub or direct pull brakes which are integrated into the rear or front wheel hubs. Some hybrids have disc brakes that have rotors and calipers in the wheel. These brakes are most effective in muddy terrain and offer better control during descents. Hub brakes are often found on bikes that emphasize durability and comfort. They’re also used in low maintenance bikes as opposed to bikes that emphasize stopping power. Linear pulls improve stopping power and good for all-around cycling. The easiest way to figure out which is right is by testing the bike. Look for those which are supportive, versatile and ergonomically designed. The seats should have cushions so you’re always comfortable. Bike seats today incorporate a lot of features such as cushioning springs, gel padding, and flexible frames. Other features you may want to look for are pressure relief points and anatomical shapes. The most important thing is to make sure the seat is comfortable. It should be the right height and you must not feel any discomfort while biking. If you’re looking for the best hybrid bike under 500, the Schwinn Men’s Network 3.0 is a good choice. It’s a hybrid bike built with versatility in mind so you can ride every day without discomfort. The swept back handlebars let you keep an upright posture as you bike. 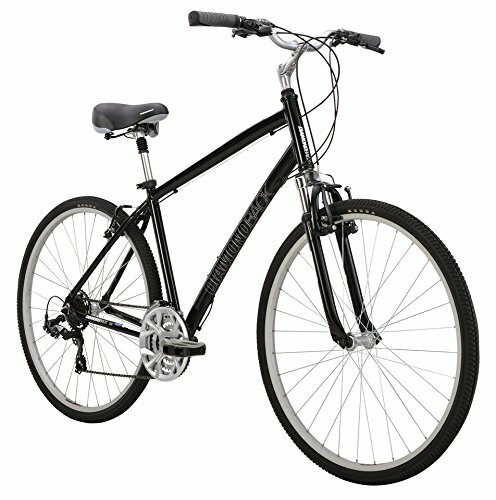 There’s no back strain even if you bike for extended periods, so it’s ideal for casual bikers who want maximum comfort. Its Schwinn suspension fork does what it should, keep the riding experience smooth even when you’re off-road. The suspension fork lets you bike over small road bumps without feeling them. Its suspension style may raise eyebrows for those used to spring mounted, rear suspension types, but as far as riding performance goes there are no complaints here. The best hybrid bikes for men under 500 are often made of aluminum and this is no exception. With this light but durable metal, they’ve kept the bike’s weight down to 50 lbs. about 7 to 10 lbs. lighter than other bikes. Because of the lightweight, you won’t have trouble carrying the bike around. If you’re going to use the bike to go to work, the light weight becomes important. 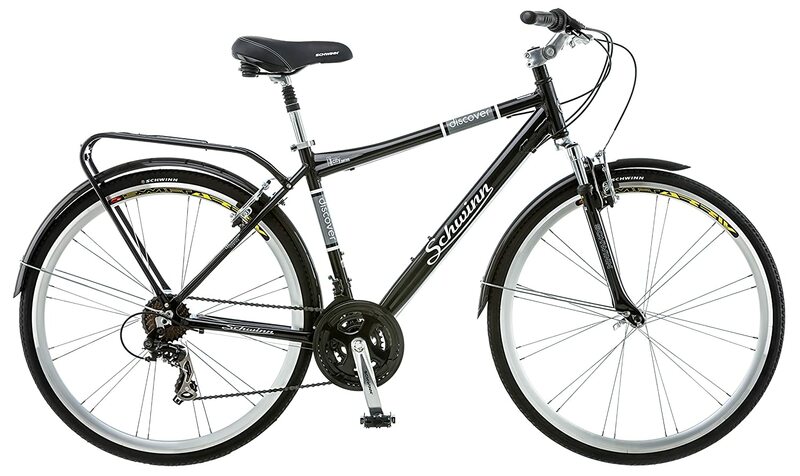 The Schwinn Hybrid has solid components and can withstand daily use. The solid design means little need for major repair work. Even with frequent use on rugged terrain, the bike holds up well. The instructions could have been clearer, but it’s not a big issue as the assembly is straightforward. The bike is partially assembled so you only need to put a few parts together. It should take no more than an hour to put the entire bike together. Some bikers prefer to go off-road while others like to bike on paved roads. The Network 3.0 rides fine on both terrains, providing speed, comfort, and superior handling. Gears shift smoothly thanks to its Shimano EZ Fire shifters, and the seat keeps you comfortable even for long periods. The bike is adjustable so you won’t have issues getting the bike to handle the way you want. Even though it rides like a dream you’ll still want to be careful. We recommend checking out some of these helmet reviews here. The Network 3.0 is a solid, well-rounded bike that offers solid performance. You can make adjustments on the fly and it is a very comfortable hybrid. 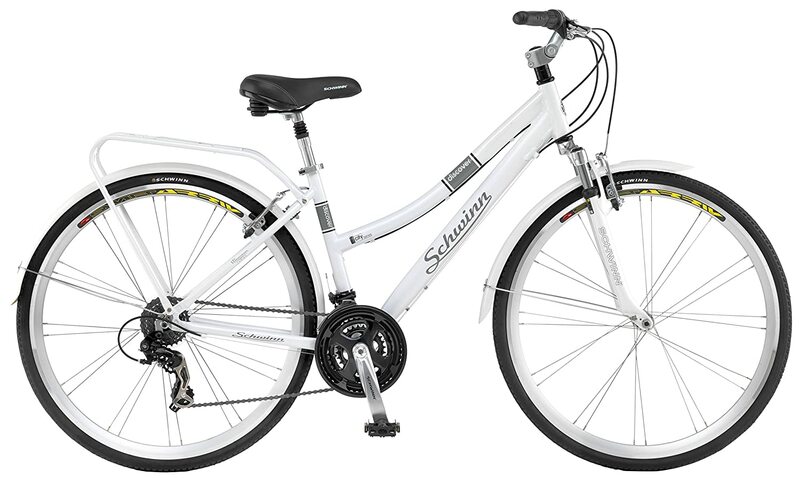 The Schwinn Discover makes a good case for being the best hybrid bikes for women under 500. As a hybrid, the Discover is ideal for casual rides, leisure rides and commuting, and it’s got a nice set of features that lead to a better bike experience. The bike is made of lightweight aluminum, but it is durable and can withstand heavy duty use on rugged terrain. At just 35 lbs. the bike makes it easy to accelerate. The hybrid frame also keeps you comfortable during long-distance rides. The Discover’s 700 C tires are meant for heavy duty use on different terrains, and the tires respond well. The bike rolls smoothly so riding is smooth and consistent. The rubbers around the wheel are high quality so you can ride for long periods without problems. The bike has a 21-speed gear range with SRAM shifters, giving the hybrid an edge when it comes to performance. With this range, you can pedal swiftly on smooth pavements, cross rough terrain or climb hills. The bike holds up well on trails, and you get sufficient power and stability even on rough terrain and hills. With its Shimano Easy Fire shifters, it’s easy to shift gears. While the Discover isn’t a road bike racer per se, it’s got the specs for it. The bike is equipped with Suntour suspension fork and gives the bike control and stability even when crossing obstacles. Combine this with the suspension seat and you’ve got a vibration-free ride. The suspension keeps the bike running smoothly even when crossing rugged terrain. Thanks to the suspension design, you’ve got complete control over the bike. It’s this level of control that makes it ideal for novices. The alloy linear pull brakes are responsive and keep you safe on the road. With these brakes, you have greater control and safer too. The swept back handlebars allow you to ride upright and in comfort. Add the comfortable seat post and you won’t feel any discomfort while biking. The Discover is an excellent hybrid bike for women looking for a bit more challenge. It’s also suitable for those who like to tweak with their bikes to get maximum performance. Are you looking for a bike under $300 that has the rugged style of a mountain bike but is still comfortable? The Discover Men’s Hybrid could be what you’re looking as it combines comfort with functionality. The Discover saddle is well padded so you’ll be at ease during the ride. It’s swept back handlebars provide a good grip, and there’s even room at the back for extra gear. 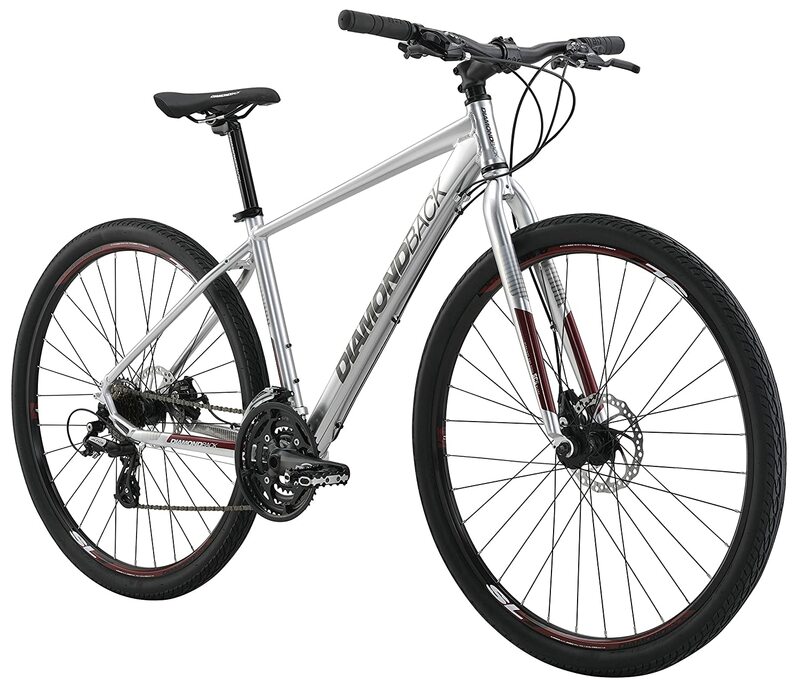 Like other Schwinn bikes, the Discover hybrid is aerodynamically sound and durable, so expect to use this for a while. Its 21-speed SRAM grip shifters provide good flexibility, and coupled with the suspension fork gives you consistent performance. Its Priomax alloy brakes are very responsive so you can stop without exerting a lot of effort. Compared to other pull breaks, the Discover hybrid is better suited to keep accidents at bay. The brakes may not look that different from other bikes, but it actually makes a difference when you’re biking on uneven terrain. 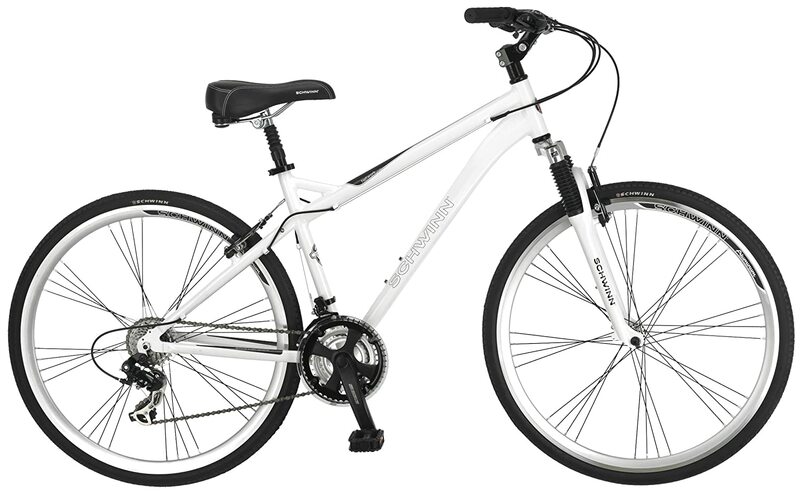 The Discover has the standard suspension fork found on other Schwinn bikes. With this design, the bike absorbs the impact brought about by rugged terrain and uneven roads. It is this feature that makes the Discover suitable as a mountain bike. The bike has a double aluminum frame is built for long term use. It manages to combine versatility and quality so it’s going to last far longer than other bikes. One of the trademarks of Schwinn bikes is their durability, and the Discover is a good example. The suspension keeps those bumps at bay, and the same thing can be said for the Shimano rear derailleur and Suntour crank. The tires are durable and like the other 700 C on the Discover for women, these tires can take a lot of punishment without needing frequent replacements. The bike needs some assembly, but the instructions are easy to follow. It won’t take more than an hour, less if you’re an experienced biker. The Discover Men’s Hybrid is a quality bike, built for everyday use on a smooth or rugged terrain. Schwinn makes a lot of good bikes and this is definitely one of the better ones they have. The best hybrid bikes under 500 should be comfortable, easy to ride and versatile, and the Northwood Springdale lives up to the billing. This hybrid is suitable for cruising around town, and the lightweight design makes it easy to maneuver. The bike rides smoothly, especially on smooth roads. Its Shimano Tourney rear derailleur and 21-speed gear keep you in control, and you can make adjustments on the fly. There are no vibrations or bumps when you ride across hills, and it doesn’t take a lot of effort to step on the brakes. You can bike for leisure, comfort, or even use this for commuting to work. While the bike can handle a few rough roads and trails, you will get optimum performance on smooth, well-maintained roads. The Shimano Tourney rear derailleur 21 speed makes gear adjusting easy. If you’re biking on trails, you can shift gears with ease. Performance is also helped by the handlebars which can withstand long term biking. The bicycle frame weighs 25 lbs. give or take, and its alloy composition minimizes wear and tear. Combined with the fenders, rear rack, and quick release seat clamp, and you have a full-featured bike. The seat and frame provide maximum comfort, and it doesn’t get affected even when you change the speeds and shift gears. The lightweight frame is durable and holds up a good deal of weight too.The 700 C wheels is another reason for the smooth riding experience. The wheels are well-made, have a good grip and good traction. Women 5’2” or shorter may need to adjust the seat to find the comfortable stance, but it’s not a major problem. The seat and handlebars work well together and keep your arms and shoulders from tiring. Like other hybrid bikes, the Springdale needs some assembly, but it’s relatively straightforward. The instructions could have been clearer, but it is not like you won’t be able to put the bike together. The Springdale is not the most durable women’s bike, but as long as you’re aware of its limitations, this is still an excellent hybrid. 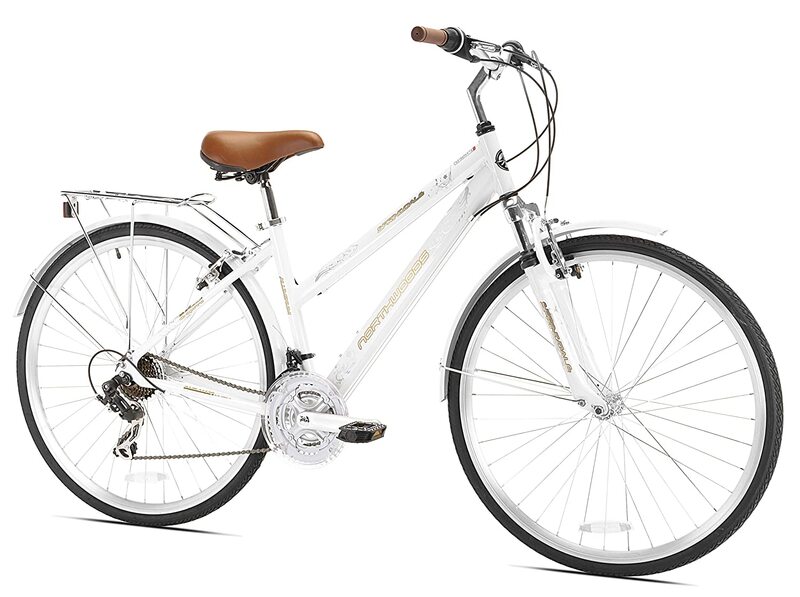 If you’re looking for a hybrid bike for women, the Springdale won’t disappoint. The Dual Sports Trace is a departure from the typically specialized bike, as it comes with several features that make it an all-around bike. What makes this one of the best hybrid bicycles under 500 is its frame design. An overly aggressive frame compromises comfort and visibility, but if the frame’s too slack, you lose out in performance and handling. To avoid this problem, the Trace has a dual sports frame, which is the best compromise. It has a slack top tube to provide relief from the wrist, back, shoulder and neck stress. However, the geometry has enough aggressive properties to propel your body’s center of gravity. This allows your body to go forward and handle the Trace’s front end while maximizing the pedal capabilities. The bike has a specially designed suspension steel which acts as a shock absorber when biking on rugged roads. The steel fork is equipped with vibration dampening elements so your ride is still comfortable. The Trace is equipped with a 21-speed drivetrain by Shimano. The name Shimano is synonymous with quality bicycle parts, so expect quality here. With this drivetrain, you can quickly change speeds depending on the terrain. The bike is equipped with high-quality Tektro Aries disc brakes so you can quickly put on the brakes. Rather than the wheel rim, the brakes interact with the rotor, leading to longer wheel life and better stopping power. If you’re on the trail, having a powerful set of brakes is necessary. With the Trace that’s exactly what you get. The Trace is equipped with a dual sports saddle so you’re always comfortable even on rugged terrain. There is no pressure on your body and your back doesn’t get strained even when riding for long stretches. The bike comes with 45c wide tires, giving you superior traction without compromising stability. The combination of stability and traction is what gives the Trace an advantage over other bikes. However, if you do have problems check out these bike maintenance tips! The Diamondback 2016 Dual Sport is a good example of an all-around hybrid, suitable for the road as well as gravel terrain. Whether you’re out to buy groceries or want to go on the trail, the Dual Sport will deliver. This hybrid bike review can say the Diamondback Edgewood is top of the line, with a dura bike, lightweight frame, excellent gear ratios and smooth gear shifts. At the heart of the Edgewood is its butted aluminum alloy frame. With its replaceable hanger and tubes, the frame works very well with the suspension for maximum riding comfort. The frame is suitable for people of different physiques, and the geometry allows for a smooth ride every time. The 50 mm steel handlebars have a solid grip, and the quality design provides you with control. The handlebar’s design ensures your body doesn’t have to be strained when you grip it. The Edgewood requires some assembly, but if you follow the instructions you should have the bike ready in 45 minutes or so. Only a few basic tools are required and once you’ve added the handlebars and the wheels, the bike is set. The Edgewood doesn’t give up anything in the comfort level department even over long distances. The adjustable handlebars are a big help here as well, and the padded suspension seat post keeps you comfortable. The Edgewood performs well on different terrains, with the suspension absorbing the bumps and shocks. The tubes are higher than normal, allowing you to pedal upright and in comfort. Going back to the grips, they’re soft on the hands so even if you hold on tight, it’s not going to put undue pressure on them. Combined with the linear pull brakes and the bike will keep you throughout the ride. The bottom line is the Edgewood delivers in ways that a hybrid bike is supposed to. Whether cruising or going on a hike, the handlebars keep you at ease and ensure you’re always in control of the bike. The Shimano 21-speed derailleur drivetrain ensures the bike rides smoothly whether on flats on slopes. Because you can adjust on the fly, it’s no longer that difficult to find the right setting for your ride. The Edgewood is a well-made bike, providing you with a comfortable riding position and a durable frame. With its easy assembly and reliable brakes, the Edgewood is ideal for beginners and seasoned riders.